A natural tooth consists of a root and a crown. If you compare natural teeth to implant-supported replacement teeth, you’ll see they have the same basic parts. 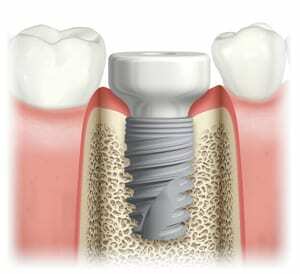 The implants themselves are small titanium screws that are surgically placed into the jawbone where teeth are missing. These titanium anchors act as tooth root substitutes. Time is then allowed for bone to heal and grow around the dental implant. The bone bonds with the titanium, creating a strong foundation to support the teeth. Small abutments that protrude through the gums are then attached to the implant. These posts provide stable anchors for artificial replacement teeth that your restorative dentist creates. Most often these teeth are only removable by your dentist. In many cases a temporary replacement tooth can be attached to the implant immediately after it is placed. In some cases Drs. Blecha and Jandali can extract the tooth and place the implant at the same time. Sometimes we can even attach a temporary tooth to the implant. However the patient cannot chew on the implant until the bone has fused to the implant or it will fail. Drs. Blecha and Jandali does provide treatment to certain patients whose remaining teeth are failing where all of the teeth on that jaw are removed and 4 or 5 implants are placed and temporary fixed teeth are attached to the new implants. This is a treatment that patients appreciate greatly. Many dental practices advertise that they do this treatment. What the advertisement does not tell you is that you must restrict your diet to only those foods that you can cut up with a plastic fork. Call Naperville Oral, Maxillofacial and Implant Dentistry Phone Number 630-961-5151 to schedule a Dental Implants consultation with Drs. Blecha and Jandali. For most patients, placement of dental implants involves two surgical procedures. First, implants are carefully placed within your jawbone. For the next two to four months (occasionally six) following implant placement, your adjacent bone fuses to the implants. This time period is known as the healing period. Your bone is fusing to the implant during this time. It is very important you do not disturb the implants during this period. You should be able to wear temporary teeth. Most patients eat a normal diet but restrict this food to the opposite side where the implant is located. On the day of implant placement, you may have nothing emerging from the gum in the implant area, or you may have a temporary abutment post on the implant emerging from the gum. Drs. Blecha and Jandali may even create a temporary tooth on a temporary abutment. The patient will typically never see the implant itself. There are two types of abutments: final and temporary. Final abutments are used to attach the final teeth. There are two main types of temporary abutments. One type of temporary abutment, known as a healing abutment, is a round or oval cylinder that fits flush with the gum, and creates an opening in the gum for future teeth. They may be metallic or white in color. Another type of temporary abutment is used to attach temporary teeth. Final abutments are used to attach the final teeth. The procedure to place an implant is usually performed with local anesthesia or with intravenous sedation in the office. The number of appointments and time required vary from patient to patient. Drs. Blecha and Jandali will discuss with you what is needed for your individual treatment. In the healing phase, your bone grows onto the surface of the implant. The length of the healing time varies from person to person, depending upon the quality and quantity of bone and the need for bone grafting. In some cases, implants may be restored immediately after they are placed. Drs. Blecha and Jandali will advise you on follow-up care and timing. After the healing period has elapsed, the second phase of treatment begins. 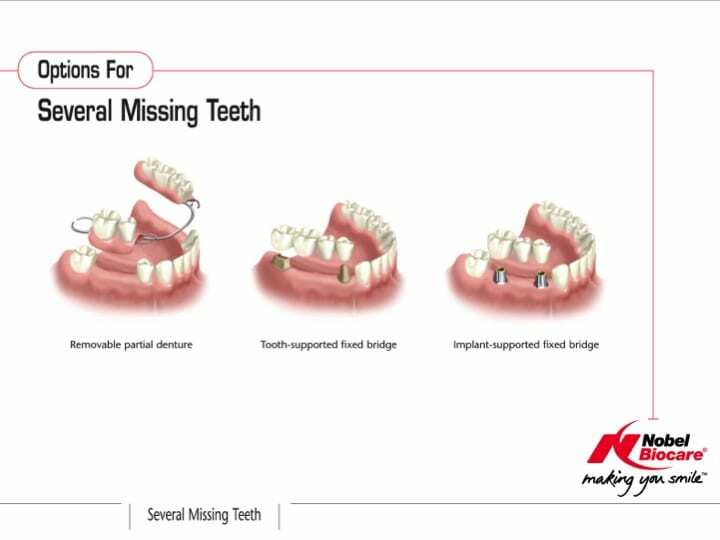 If no temporary abutment was initially placed, Drs. Blecha and Jandali will uncover the implant and place a healing abutment. If a healing abutment was placed at the time when the implant was placed, Drs. Blecha and Jandali may or may not need to do a minor recontouring of the gum. In placing implants, Drs. Blecha and Jandali not only tries to achieve proper bone-implant fusion, but also tries to re-establish a normal gum architecture to recreate as normal of an appearance of the tooth emerging from the gum as is possible. In some cases, Drs. Blecha and Jandali may place temporary teeth on either temporary or final abutments. The dental implant final crown needs a strong tough gum tissue around it that can withstand food smashing down off of the tooth with normal chewing. In some cases, it may be beneficial to perform a soft tissue graft to obtain stronger, more easily cleaned and natural appearing gum tissue in the area around the implant. Drs. Blecha and Jandali tries to avoid this if possible. This process involves moving a small amount of gum tissue from one part of your mouth to the area around the implant. Most often, it is a brief and relatively comfortable procedure. Sometimes other approaches or graft materials are utilized. Whether it’s one tooth or all of your teeth that are being replaced, your restorative dentist will complete the treatment by creating a final abutments and final teeth on the implants. Implants are often placed several months after extraction. At times, an implant may be placed immediately after extraction of a tooth. 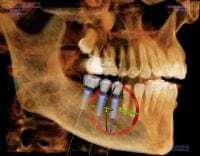 This may involve a little more risk, but it simplifies the process—you won’t have to wait for another appointment to place the implant at a later time once the socket has healed. Drs. Blecha and Jandali will evaluate your situation to see whether immediate implant placement is advised. Most frequently, one implant per missing tooth is placed. Sometimes we can less than one implant per tooth, depending upon the quality and quantity of bone that is present. In some cases we can replace all of the teeth on one jaw with just four implants. Each patient is evaluated individually. Implant placement is a finesse treatment, usually resulting in minimal patient discomfort. For placement of one or two implants, most patients can return to work the following day, although we do not suggest an extremely busy schedule the next day. Certain types of bone grafting may produce swelling and more discomfort after surgery. If Drs. Blecha and Jandali believes the treatment will require you to miss a day of work, he will inform you of this. If a second surgical procedure is required after the implant has healed properly, this second procedure should result in even less or no discomfort. Each implant treatment is customized according to the needs of the specific patient and their restorative dentist. Drs. Blecha and Jandali works with many fine restorative dentists in the Chicago area. A single implant prosthesis (crown) is used to replace one missing tooth – each prosthetic tooth attaches to its own implant. 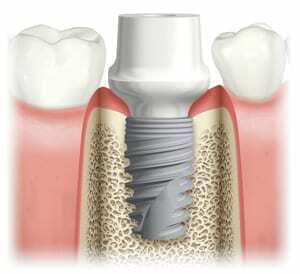 A partial implant prosthesis (fixed bridge) can replace two or more teeth and may require only two or three implants. A complete dental prosthesis (fixed bridge) replaces all the teeth in your upper or lower jaw. The number of implants varies, depending upon which type of complete prosthesis (removable or fixed) is recommended. A removable prosthesis (overdenture) attaches to a bar or uses ball in socket attachments. 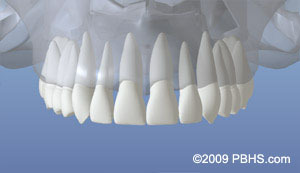 A fixed prosthesis is permanent and removable only by the dentist. Advancements in CT (computerized tomography) scans have led to tremendous improvements in understanding the specific bone defects and anatomical limitations that effect quality implant treatment planning. 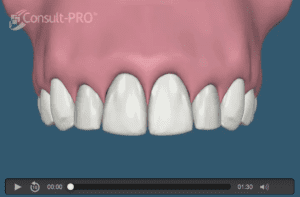 Using special software, dental implants can be planned and placed on the CT scan. From this process, Drs. 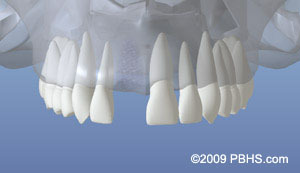 Blecha and Jandali can determine the number, spacing, and size of each implant used. Drs. Blecha and Jandali will then create a “Surgical Guide”, which he will then use to guide him in placing the implants in the position planned on the CT scan software. Drs. Blecha and Jandali was amongst the earliest of implant surgeons in the Chicago area to implement this technology. All implant cases are planned using this technology. Why Select Dental Implants Over More Traditional Types Of Dental Restorations? There are several reasons: Why sacrifice the structure of surrounding good teeth to replace a missing tooth with a bridge? In addition, removing a denture or a “partial” at night may be inconvenient, not to mention that a removable partial or denture can slip and can be uncomfortable and embarrassing. Implants do not develop dental caries and are more resistant to gum disease than your teeth. However, if you do not take care of your implants, you can develop problems with them. 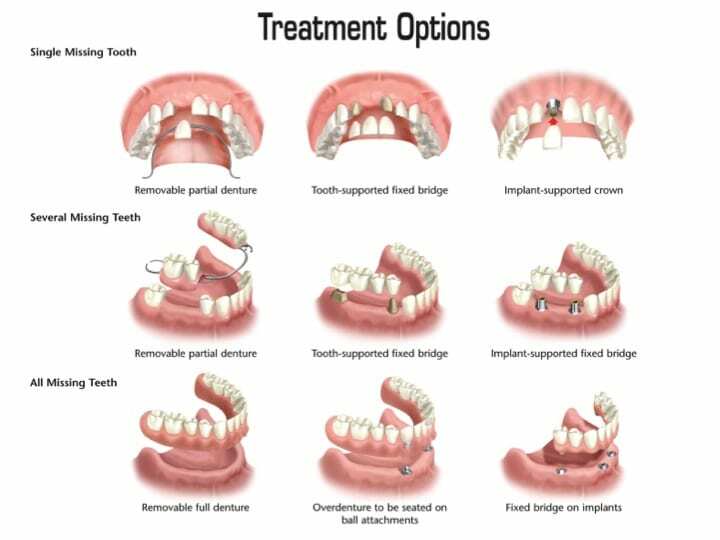 The typical patient having implant treatment values the treatment and takes proper care of them, thus avoiding problems. Once the implants are in place, they will serve you well for many years if you take care of them and keep your mouth healthy. This means taking the time for good oral hygiene (brushing and flossing) and keeping regular appointments with your dentist, and Drs. Blecha and Jandali if needed. Drs. Blecha and Jandali will perform a thorough evaluation of your medical and dental history, oral examination, and CT scan evaluation to advise whether you are a good candidate for this treatment. He will explain to you what is involved in the entire treatment process, as well as what complications could occur. If the bone is inadequate Drs. Blecha and Jandali will advise you what options exist to improve it. If Drs. Blecha and Jandali feels that you are not a good candidate for an implant, or if he feels you are best to choose a treatment plan not involving an implant, he will advise you of this as well. A Swedish scientist and orthopedic surgeon, Dr. Per-Ingvar Branemark, developed this concept for oral rehabilitation more than 40 years ago. With his pioneering research, Dr. Branemark opened the door to a lifetime of renewed comfort and self-confidence for millions of individuals facing the frustration and embarrassment of tooth loss. Drs. Blecha and Jandali has utilized Dr. Branemark’s implant treatment concepts for over 25 years. Most of the implants that Drs. Blecha and Jandali has placed over the past twenty five years are still functional today. You may have to replace the crown on the implant if it becomes damaged or worn, but typically the foundation (the implant) remains.